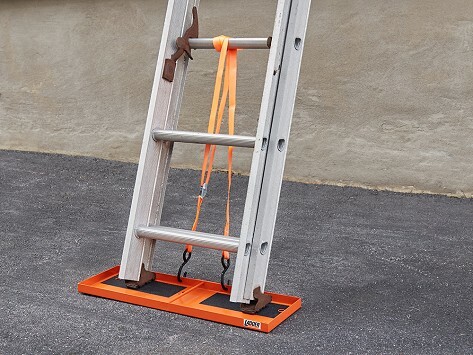 Before you head up, set up this ladder stabilizer for increased safety (and peace of mind). The heavy-duty traction pad works to secure a ladder and help prevent ladder kick out. Non-slip rubber grips are suited for surfaces like hardwood, concrete, and tile, while ground staples help on grass and gravel. Stakes do the job on snowy or icy spots. Warning: Read instructions before use. Always clear surface of sand or any loose debris before putting saddle down on hard surface. Sand, dust, or loose debris could cause saddle to slip. Do not use on artificial lawn surfaces or asphalt. Not recommended for use with extension ladders larger than 32 ft.
Dimensions: 26" x 8" x 1"
As the owner of a painting company, Ladder Lockdown Maker Troy Kumprey was aware of the potential danger of working on a ladder. When an employee fell from one, Troy was inspired to create an extra measure of safety anyone on a ladder can benefit from. His sturdy solution is a heavy-duty traction pad that lends stability to a ladder and can help prevent one from falling out from under you. It works indoors and outside. Non-slip rubber grips are suited for surfaces like hardwood, concrete, and tile while ground staples help anchor it to grass and gravel. Ice stakes help out in snowy or icy spots. Once your ladder is set up and secured in Ladder Lockdown, you’re ready to tackle the task at hand with increased stability and a better sense of security.